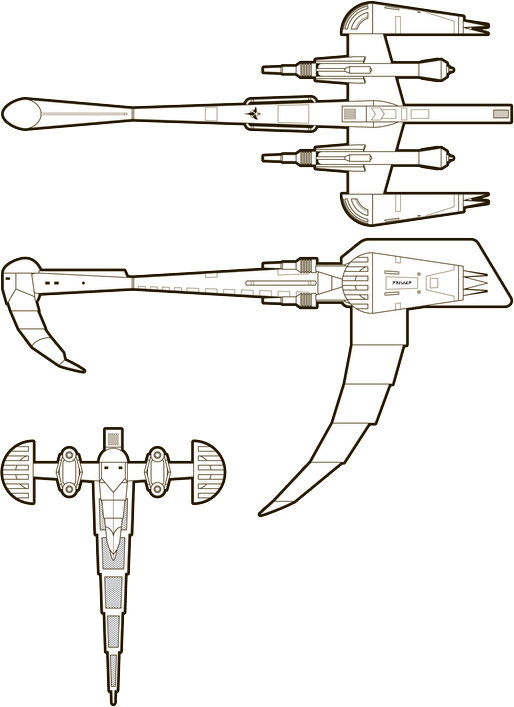 The Mevak class of hunter-killer was one of the most unusual looking designs to come from House Korath. Nearly every main component of the K-37 was designed to allow the Mevak to continue focusing fire on a single target. The four main disruptor cannons can fire independently or in unison against a single target. Each disruptor has a separate fire control center, all linked to a central fire-control hub in the forward engineering hull. This is further connected to the main combat station located on the bridge. Each of there redundant connections is armored and hardened, making it nearly impossible to completely eliminate the combat capability of the K-37 without destroying the main cannons. The K-37 utilized a unique, and moderately successful quad-engine design to ensure raw power was available to the main weapons. The K-37 technically has four full sets of warp coils, all of which tap into the main power system to provide warp capability. The outer most engines are typically used to provide the space warp effect, while the inner two engines are fully energized to provide additional power to the main weapons. This made the K-37 even more dangerous in battle and earned the medium sized craft a well deserved reputation. Despite it’s combat capability, the K-37, like many other hunter-killer designs, had a wide range of shortcomings. No provision for crew comfort was provided, with most K-37’s being based as a mobile outpost or small ground station. No live food, medical or recreation facility was provided. The K-37’s large shield spire did provide sufficient space for each crew member to have their own “quarters”. Most of these quarters were extremely sparse, but were still considered a luxury in the Klingon Navy. The K-37a was equipped with four KWB-1 warp engines, giving the vessel excellent power. However, maneuverability was less impressive. Sensors were also underwhelming, with the primary combat sensors the only long range detection equipment on board. The K-37a’s most impressive feature was the powerful and efficient KSD shield system, installed into a under-slung “scorpion” tail below the main body of the ship. Significantly more efficient than the systems used on many other Klingon vessels, the KSD allowed commanders the ability to protect themselves and still bring heavy firepower to bear on enemy targets. Despite it’s shortcomings, this made the K-37 a popular vessel. The K-37 saw extensive action against the Kinshaya where squadrons of these hunter-killers could pummel enemy cruisers while taking multiple hits. Unfortunately, the lack of a large crew, repair equipment and short range all meant that the K-37 was limited in its range and capability. Several were forced to be scrapped after battle due to on-going fires and the lack of repair systems. While the ships got their crews home, the process often damaged the K-37 so badly it was scrapped. The K-37 saw surprisingly little combat during the Four Years War, a fact that angered many ships commanders. Most K-37’s were retained along the Kinshya boarder or assigned to duty along the Romulan boarder where there was little opportunity for glory. Those that did see action in the War were brought in at the tail end of the conflict, well after the Empire’s offense had turned to a loosing defense. Although several design companies put fourth update ideas for the K-37, the extensive expense of the ship meant funding was transferred to other more versatile designs by mid-War. Production of the K-37 was finally ended in 2259. The K-37 continued to serve along the Federation, Triangle and Romulan boarders until 2268 when the last ships was removed from general service. OF the 212 K-37’s built, 71 were destroyed, 11 scrapped, 9 captured (5 by Star Fleet, 3 by Romulans, 1 by unknown forces in the Triangle), 60 were sold (30 to Nausiccans, 20 to individuals in the Triangle and 10 to various Orion clans), 20 were traded to the Romulans and 23 are in service to ranking families in the empire. A group of 15 are listed as missing and believe to have defected to the IKS. 3 more are missing under unknown circumstances. The K-37 was built at the Quronos shipyards. Power Units Available – 8 ea. Disruptor Cannon: The main ‘f’ disruptor cannons are treated as a standard disruptors during the scenarios. However – the captain of the K-37 may choose to double fire the ‘f’ cannons during any one turn. Sufficient power must be available to double fire the cannon chosen. The K-9 take damage equal to 1/2 (round up) the normal damage of the cannon. This damage may be absorbed by the forward shield (if active) or distributed to the engines and hull in any amounts the K-9’s captain wishes. A double fired cannon must attack the same target for both attack rolls.